It read like the gravest of murder mysteries. There was a spiracle missing on the side of my honey bee. The book I read said it was supposed to be there but it was conspicuously absent. What was wrong?? Was I looking at a serious mutation in my bee? Was it contagious? What was going on!!!!! Where was that spiracle? It would be nice if the answer were easy… Or rather, I should say the answer is easy…. but complicated. Read one book and there are nine spiracles on each side of a honey bee. Read another and there are ten. Read a third book and there are two spiracles on the thorax and a fourth will claim three… So who is right??? Who is wrong??? What is going on and where is that spiracle???!!!??? 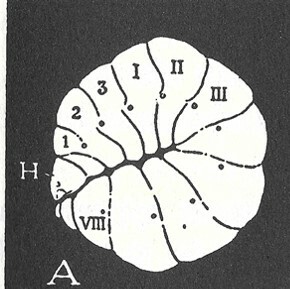 On this picture, you can see that the Roman numerals, which number the segments of the abdomen, start at I on the thorax, where the third spiracle is at. As such, it would be technically correct to say there are two spiracles on the thorax but…. it would also be accurate to claim three spiracles to the ‘thoracic area’ or claim three by acknowledging the way the first abdominal segment is positioned on the thorax.That did very little to solve the initial question though as we are still left with a missing spiracle. So… if the larvae started out with ten spiracles, where did it go? Here is a picture of the young larvae, with all ten spiracles marked as dots along the centerline of the larvae. Note: only spiracles one through nine are listed. 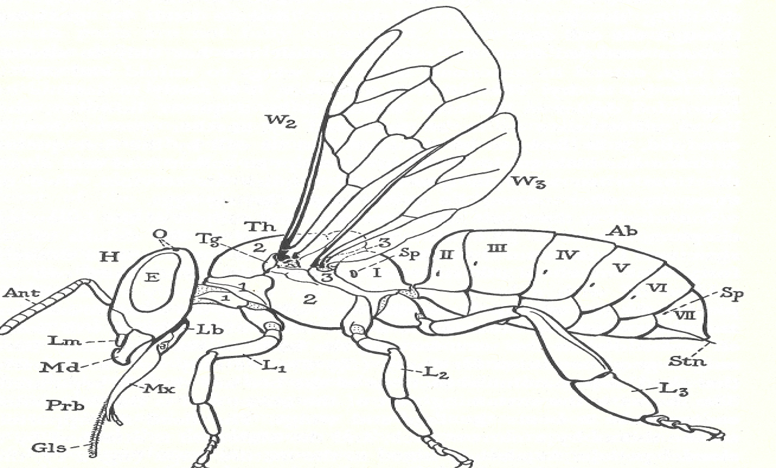 The latest addition of the Hive and the Honey Bee lists the tenth spiracle as located in the spiracular plate associated with the base of the sting and, given it states there is a way for the spiracle to stop the escape of air, it lends credibility to the thought that the tenth spiracle, though often forgotten, is functional. There is no notation for it in the above picture but other texts list it as having the second largest opening of the ten spiracles which would imply it is anything but vestigial. So… we have found the missing spiracle. You won’t see it if you put a magnifying glass on the bee’s abdomen but the tenth spiracle does exist, it is just not readily visible unless you are willing to get up close to the honey bee’s sting — an area beekeepers generally try to avoid. Which is the more accurate answer? Two or three, nine or ten?? I guess, as long as you take into account every reason for the differences (nine visible, ten functional — three on the thorax if acknowledging the transfer of the abdominal segment, two on the actual thorax) you could say any one of those variations and be correct… Technically…..
Staci Siler is a Master Beekeeper living in South Carolina. She teaches all levels of beekeeping classes and frequently speaks at beekeeping associations across the state. She is the current Secretary of Mid-State Beekeepers located in the Midlands of South Carolina. In Apis Mellifera or honeybees, the Proboscis Extension Reflex, PER, is part of the honeybee’s feeding behavior. The PER is a natural behavioral reflex in which the honey bee extends its proboscis in response to antennal stimulation with a sugar solution, during normal foraging behavior, PER occurs when the honey bee finds nectar in a flower. For example, If a honeybee went out of the hive to find nectar in flowers, and then found nectar, it would stick its Proboscis out to sense and smell it. After the Proboscis senses it, the bee will collect the nectar and then bring it back to the hive. If this bee was impaired form the toxic Neonicotinoid, Imidacloprid, it wouldn’t be able to sense the nectar, collect it, nor bring it back to the hive. That is how Imidacloprid can affect a whole hive, just by infecting one honeybee and impairing its Proboscis Extension. The PER can be seen as one of the honeybees most vital tools. This is because, without it, the bee wouldn’t able to test if the substance it is retrieving is nectar, or another, poisonous, substance. Therefore the PER is vital to the honeybees survival and could mean life or death if it becomes impaired under the influence of the toxic neonicotinoid Imidacloprid. The PER happens as one swift motion in a honey bee, it is absolutely amazing to watch! My wife told me yesterday that one of my bees bit her. I cringed and corrected her, “You mean it stung you?” “Yes,” she said. I went on to explain that her faux pas might lead to an uncomfortable situation should she mention amongst a group of beekeepers that a bee bit her. She understood. But the fact is, it’s possible a bee bit her or at least could bite her. Today’s beekeeping vocabulary word is “Mandible.” Honey bees have jaws called mandibles that have lots of uses. Below is an excerpt from Rusty Berlew’s excellent blog called Honey Bee Suite. Rusty writes an excellent beekeeping blog and tackles very interesting articles. I highly recommend it.